Try neuCRM at NO Cost. FREE for first 500 user-months* ! Download the neuCRM from above Download link. Your downloaded file will be in .vmdk (Virtual Machine Disk) file format. It is Virtual Machine (VM) Virtual Harddisk, which means a Copy of Hard disk, loaded with Operating System and all necessary Softwares. Connect this Downloaded Virtual Machine .vmdk file on your VM application and Run. Please refer the Minimum System Requirements given here for the neuCRM Guest OS Virtual Machine (VM). Since Virtual Machine utilize Hardware Resources of Host Machine, the Host Machine Requires higher Resources than the Virtual Machine's Required Configurations. ** Performance Study is Required. Our Technical Team will analyze and provide optimized solution. Server Machine is the our Physical Machine (so called Host Machine) and having all your Physical (Real) Hardwares like CPU, RAM, Hardisk, Network Card etc. 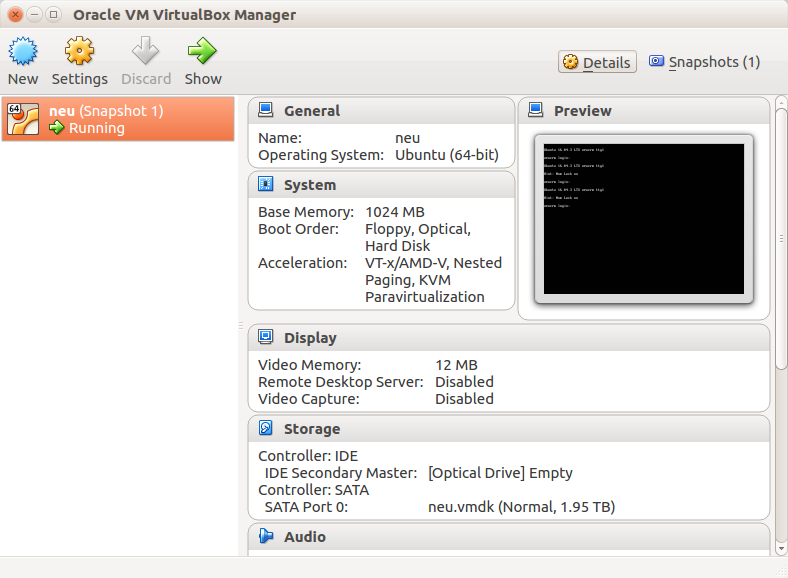 Virtual Machine (VM) is a Virtual, it uses the Resources of Physical Machine's Hardware virtually. And install any of you favourite Virtual Maching Software Application for running neuCRM VM. The most popular are: Oracle Virtual, VMware Player and Proxmox. Dowload the neuCRM Virtual Harddisk file from above Download link, and keep the downloaded file in big sized partition. The neuCRM Virtual Harddisk file size would be 10 GB approx. While neuCRM is running, this Virtual Harddisk (neucrm.vmdk) file may expand up to 2 TB. It is recommended to keep this file as small aspossible for Performance reason. Because of this reason we have introduced Remote Storage feature. Remote Storage feature is the facility to utilize the spare Storage space on any Remote Server, this spare storage area on the remote server virtually becomes the part of neuCRM server's storage space. This way neuCRM gets Unlimited Storage Space. This Remote Server can also be kept with in LAN for accessing files in faster speed. Your Host machine also can be configured as Remote Storage Server. Need assitance to setup up neuCRM server ? Let us know your issue via our support email or by Telegram messanger, we are here to help you ! Before Run your neuCRM on Virtual Machine(VM), configure one Virtual Network Interface Card on your VMware Player or VirtualBox. This Virtual NIC / Ethernet Port should be in Bridged Mode. This is most common mistake by many. 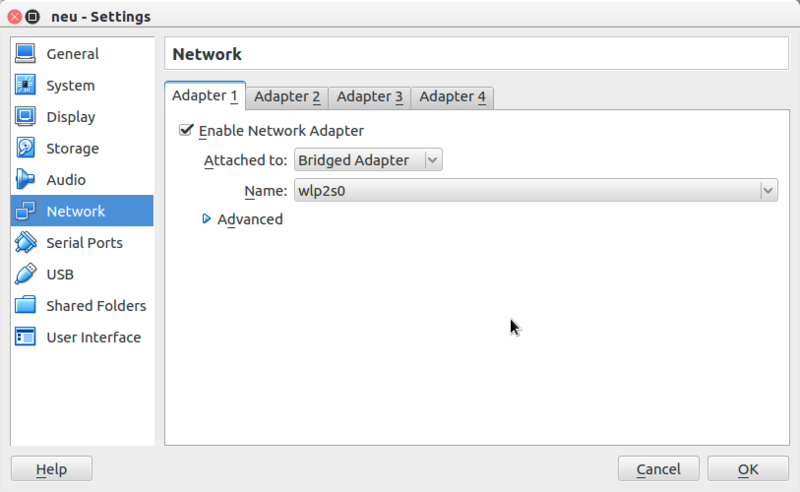 If Network Adapter is Not in Bridged Mode, you can't access neuCRM from outside network. Allocate minimum 1 GB RAM to neuCRM VM. And you can increase it later on if required. 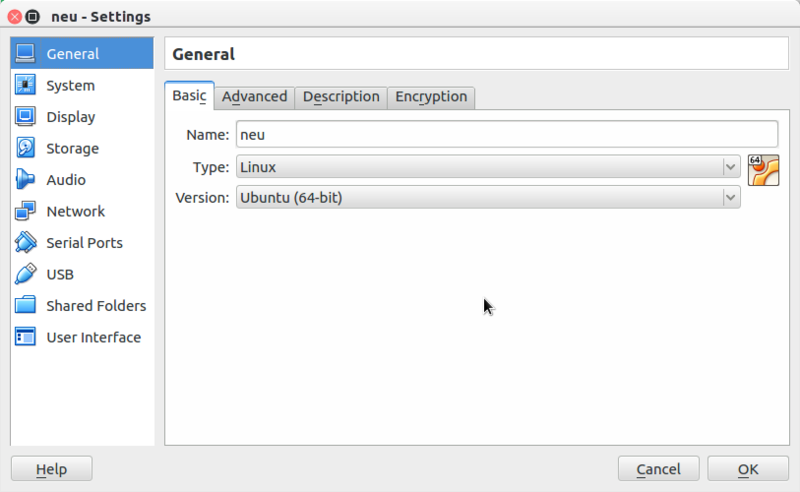 And configure your VM(Virtual Machine) for this neuCRM package as Ubuntu 64bit Operating System. After power on/Start your neuCRM Virtual Machine, a login prompt will appear. Once neucrm login: prompt comes, means that neuCRM is ready and starts functioning. You Need not to Login via VM any more. Leave it as it is. Now you can access this neuCRM only from Web interface. Newly Downloaded VM was pre-configured with the IP Address: 192.168.1.100 on its Virtual Network Interface Card. All the configuration & Administration should be done on web interface only. If you are unable to access web page on 192.168.1.100, try to ping 192.168.1.100 from your host machine or from any computer on LAN. And also make sure that there is no other computer assigned with same IP (192.168.1.100), this will create IP Conflict. If you are unable to ping 192.168.1.100 please check, is your computer has IP Address in 192.168.1.x, if not please add. After login into neuCRM web control panel page, you may change IP Address of neuCRM server. Please read our Quick set up Guide and Speedy migration Guide. 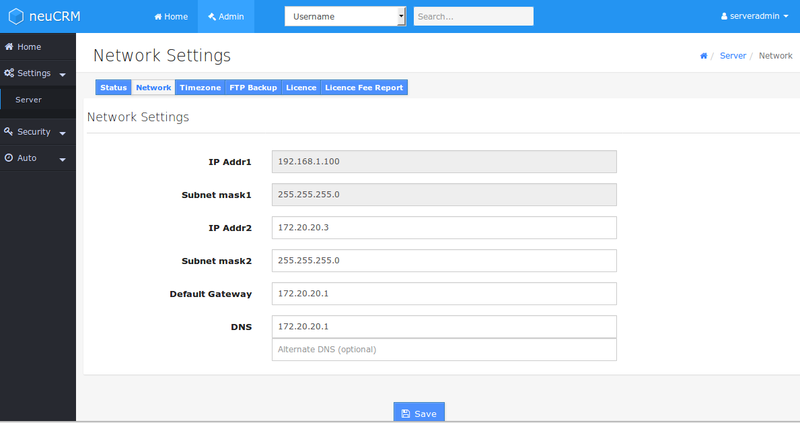 Configure your Network: IP Address, Subnet Mask, Default Gateway, DNS etc. on neuCRM : Admin → Settings → Server → Network menu. After changing Network Settings you must Restart the VM. Adjust your Timezone Settings, at : Admin → Settings → Server → Timezone menu. Enter your Licence details which is got from Registration, at : Admin → Settings → Server → Licence menu. After validating Licence information, You will get FREE Credits worth 500 Internet Users Licence. You can use neuCRM at Free of cost up to 500 User-Months*. Beyond that you need to Purchase Credits from here. Which means that you can use these 500 CREDITS to: 10 user for 50 Months or 100 user for 5 Months or 500 user for 1 Month. * Register now and Get FREE Credits worth 500 User-Months. We are not offering neuCRM as hosted service, we let it to our Resellers. If any one want Run this CRM packages as hosted service, you are encouraged to setup your own Server and offer it to ISPs. Reseller can charge nominally for the service offered to ISPs. Resellers are permited Re-Brand this neuCRM into their own Brand name. There is a huge demand from small ISPs and Hotel/Restaurants/Hospitals who offering Public WiFi Hotspots to their customers. Hosted service is useful where installing & maintainng a separate neuCRM server is difficult & not economical.